We stayed at Elizabeth in 2009 and loved it. The staff so helpful and kind, Helen and her family made the holiday feel that you were special. We could not get in this time, but we used the place everyday and the food was of a high standard especially the Sunday roast Geek style! We have promised to make sure we get booked in there next year, AND we always feel protected well by the first choice team! We love every minute of it! We've stayed at these apartments on many occasions and as per usual we love every minute of it. The family are all so friendly and treat you like one of their own, my oldest son has been learning more and more of the Greek language every time we go over. We are going back 2011 and can't wait to see the new arrival and the rest of the family. The accommodation has always been clean and the pool and gardens are well looked after, the accommodation is basic but that’s Greece for you but after all you are self-catering, as for not getting your bin emptied from Friday to Monday, (is there something wrong with your arms that you can't do it yourself) and if you can't get out of bed to let the maid in to do your room, well it won't be getting done, remember its apartments not a hotel. Well we arrived and where welcomed by costas and he was great, we had been placed on a upper floor apartment but costas was so helpfull, the location of the hotel was near to roda 5min walk if that,the hotel was basic but very clean. The entertainment was fab, we had a greek night and bbq so very good, we did bingo and karioke and we even got to watch the erovision so great..! We are already looking at trying to return as it was great well done costas and olga and family. Well I returned from elizabeth studios about a week and a half ago,and I miss it already. I had an amazing time, and I couldn't fault the place at all! The rooms: ok these were basic, nothing amazing, but I sometimes think people just whinge about nothing after hearing some of the reviews! you're not even in the room most of the time, and they were perfectly clean and tidy so they were fine. We did end up having a few ants around in the second week but it wasn't the end of the world. The staff: most of the staff were really friendly and welcoming. The food: This was lovely, and pretty well priced too. A wide selection of drinks, snacks and meals, and the service was good too, espicially when the staff came round to your sunbeds taking orders and bringing food and drink to you. 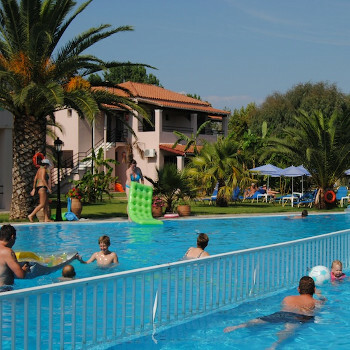 The place: Gorgeous clean pool, lovely gardens and plenty of sunbeds so there is always plenty for everyone. Lovely bar and snack bar with pool table etc. Overall I couldn't fault anything, we all had an amazing time and elizabeth studios is a lovely place! When we arrived at the appartments we were greeted by Helen, at the pool side. The pool was amazing very big and very clean. It is surounded by lots and lots of sunbeds so you never had to fight over them. Sadly this was the best part of the place. Our appartment had 2 bed rooms a bath roon and a "kitchen". The Kitchen made up of a sink, fridge and a camper cooker which was rusty and older that me. The bathroom shower had no shower curtain, a bathroom cabinet that was incrusted with tooth paste and a toilet that would not flush any thing more than water! When i mentioned this to the rep She told me "thats Greece!" Her first reaction was to insinuate that we had been putting paper down there, then agreed that they may have a problem with the plumbing but can not of mentioned it to the owners as nobody came to look at it. Toilet role was not provided and the paper bins were only emptied 5 days a week which meant that come monday you had friday's saturday's and sunday's used paper smelling in 35 degrees of heat! Very friendly, comfortable and pleasant stay. Costas and Olga with their staff work very hard to make your stay as good as possible. We would definately stay there again. We have visited these a appartments 3 times and each time have had a fantastic time. The place is clean friendly and very welcoming. The accomodation is basic but when the bar and surrounding resturants provide such great food you dont really need to cook! The local super market is close by. The location is great the pool is clean and the small town of Roda has everything you need. The staff are really nice and welcome you with open arms, as I said 3times we have been back and have booked for 2009 already. In the evening Costa will have a few silly games to play or the weekly bbq but if you dont want to join in then there is no preasure do to so. I cant wait to go back and neither can my family! Arrived at 4am and was met by Costas. He was cheerful, polite and couldn't have been more welcoming (even at that crazy hour). The room was extremely clean and although it was basic self catering, you didn't need anything else for your stay. Only drawback was the air conditioning wasn't operating on that first "night" due to such a late arrival time but that was rectified in the morning when I paid the local charge for it. The staff were superb, they made you feel comfortable and extremely welcome and you would be very hard pushed to find better service elsewhere. All the food we ate at the pool bar was lovely and there was a pretty good variety to choose from. The cost of the food and the drink was very reasonable too. The pool was fantastic and although it was open for non-residents to use too, it was never too crowded and there were always sunbeds available. The distance from the apartment to the main resort centre of Roda was within an easy walk and when we visited the "town" it was never riotous although quite busy. This was the first time I'd been abroad on my own without another adult with me and I took my 13 year old daughter. We had a fantastic time. The First Choice rep called Alex was brilliant and she visited the apartments regularly. I'd definately recommend the apartments to anyone looking for a relaxing family orientated holiday and I'd be more than happy to return in the future.